It may allow them to have better control over fermentation of their cacao. Understanding of how different varieties can impact the fermentation may help them improve the quality of their cacao, and perhaps increase what they can sell it for. Makers who work closely with farmers can offer them helpful cost effective ways to improve fermentation, such as separating the cacao into varieties before fermentation, as well as using a starter culture to have more control over this process. This research helps us understand that variety does impact the quality of the cacao, and so paying attention to varietal information on our chocolate bars may in fact make us wiser about our choices. These microorganisms which occur during fermentation produce acetic acid, lactic acid, and encourage enzymes to alter protein and carbohydrate molecules. This prepares the kernel (AKA cocoa nib) for roasting later on. The kernel is the part of the seed which is ground up and turned into chocolate. Without fermentation, the roasting process wouldn’t have the molecules it needs to develop the flavours we enjoy so much. Fermentation essentially breaks down molecules within the kernel so that they can be rearranged to build aroma molecules during roasting. It’s the reactions that occur during roasting that allow for a majority of the development of the chocolate flavour. This simple figure I created illustrates what I mentioned in the paragraph above. You see that in order for aroma molecules to form during roasting, other molecules need to be broken and altered during fermentation. Fermentation doesn’t create the chocolate aromas, but allows for them to occur later on. Most studies try to analyze the impact fermentation has on cacao. This makes sense, since fermentation dictates the future flavour of the cacao seeds and hence the flavour of the chocolate produced from those seeds. However, Menezes et al. (2015) wrote an interesting research article on how the varieties of the cacao itself impact fermentation. So although fermentation alters the cacao seed, this preliminary research hints that perhaps the variety of cacao also alters how fermentation occurs. Each of the 4 varieties of fermented seeds had a different populations of microorganisms involved. Each of the four fermentation batches weighed 100 kg each, and were all replicated 3 times. The fermentation lasted 7 days (168 hours) and the cacao seeds were turned every 24 hours. The seeds were then dried, and sent to Sartori and Pedroso Alimentos Ltda. (Sao Roque, SP, Brazil) to be turned into 70% dark chocolate. Each of the four fermentation heaps were inoculated with S. cerevisiae CA11 (brewers yeast). The population of the yeast was monitored in real time using qPCR (quantitative polymerase chain reaction) for the entire 7 days (168 hours) of fermentation. The qPCR was used to not only to detect and monitor the DNA of the yeast, but also give us information on the quantity of the yeast over time. Often, cacao seeds are fermented by naturally occurring yeasts from the surrounding environment. However, it’s been suggested that inoculating the fermentation heap allows for better control of the entire fermentation process. Using S. cerevisiae to jump start fermentation is known to accelerate the process by consuming carbohydrates more quickly and producing high ethanol levels, which prevents undesirable microorganisms from being produced. Although we want yeasts and bacteria to grow, there are many we don’t want growing and spoiling the fermentation heap. Figure 1 displays the populations of the yeast according to each of the four types of cacao fermented. Cacao type FA13 saw the greatest population while PS1030 saw the lowest. We also see that the population of yeasts fluctuate as well throughout the 7 days of fermentation. Remember, these four types of cacao were all processed at the same farm and inoculated with the same amount of brewers yeast. 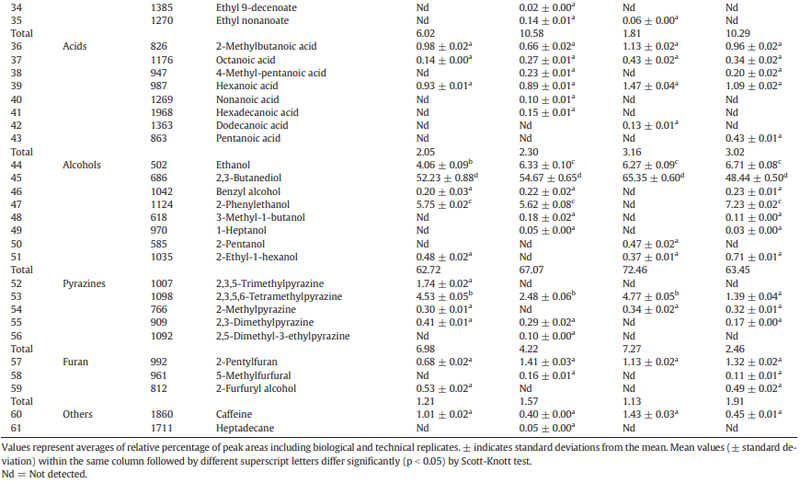 For this, qPCR as well as DGGE (Denaturing Gradient Gel Electrophoresis) were two techniques used to identify the DNA of the various microorganisms that existed together within the fermentation masses. You don’t need to know exactly how these techniques work for the purpose of this summary. At most, understand that the researchers were able to use these techniques to quickly identify the species of microorganisms involved. If you’re interested in learning about DGGE, check out this article from The Science Creative Quarterly that does a good job of explaining how this technique, invented by Leonard Lerman, works and why it’s important. Now let’s look at what was discovered in these fermentation masses. The letters within the gel image correspond to the species which were identified. For example, P. Kluyveri (letter “b”) can be seen identified at 96 hours for cacao type CEPEC 2004, but doesn’t show up at any point for cacao type CCN51. Figure 2 displays the species of yeasts identified according to the four varieties of cacao. During the 168 hours, samples were taken and analyzed 8 times. The letters within the figure correspond to the various species of yeast identified. You can see that some species of yeast were not detected in some samples, while other samples included all species identified. 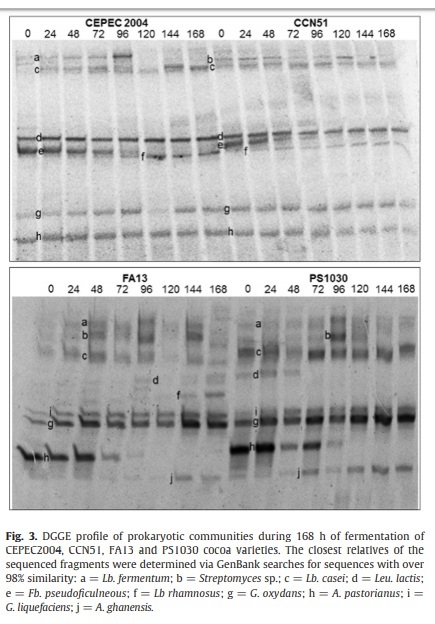 For instance, the yeast P. kluyveri was not detected at anytime for CCN51, FA13, or PS1030. Candida sp. occurred within the fermentation mass for CCN51 and FA13 only. The letter “e” at the bottom identifies the DNA of the cacao itself. The population sizes and types of bacteria present in the fermentation heaps also differed according to the varieties just as they did for the yeast populations. According to this research, the dominant bacteria species were Lb. casei and G. oxydans, even though most experiments that relied on spontaneous fermentation (not inoculated) found Lb. plantarum and Lb. fermentum to be the most dominate bacteria. Lb. plantarum was not even identified here. There were 61 aroma compounds identified between all 4 varieties, but their concentrations and presence differed according to the various varieties. Below is a table that includes all the aromas identified. They are organized according to what group of aroma molecules they belong to. The table doesn’t explain what the technical word used for each molecule smells like to us, but here it’s more important to be able to observe that these the presence and concentrations of these aromas differ according to variety. To learn more about the various groups, take a look at another blog summary explains further the aromas within chocolate. It’s suggested that these differences in aroma molecule profiles are due to the the different microbial populations and metabolism that was different for each variety. Let’s make a few comparisons. CCN51 is known to be a very low quality cacao in regards to flavour. Variety PS1030 appears to be considered more pleasant. If we compare the concentration of aromas between these two we see some patterns. The ester “ethyl octanoate” is said to have a fruity and floral aroma associated with it. CCN51 had a concentration of 0.09%, while the more favorable PS1030 had a concentration of 0.28%. Ethyl phenylacetate (honey aroma) was at a concentration of 0.09% for CCN51, but .89% for PS1030. The pyrazine 2,3,5,6-Tetramethylpyrazine which is associated with a harsh fermented/natto aroma was found at higher concentrations in CCN51 (4.53%) as opposed to only 1.39% in PS1030. So we see here a pattern of more favorable aromas having higher concentrations in the more favorable tasting chocolate, and more unfavorable aromas having higher concentrations in the less favorable tasting chocolate. Numbers aside, the more qualitative aspects of the chocolates were analyzed. It appears from the figures below that the chocolates produced from these 4 varieties of cacao differed according to sensory attributes such as taste, smell, and melt. Continuing with our comparison above, CCN51 (“a” in figure 5 below) along with FA13 (c) had a very bitter taste, and was associated with a sour smell. PS1030 (b) didn’t have the same intensity of bitterness, and was also associated with a caramel flavour. We see some parallels between favorable cacao and favorable traits of the chocolate made from these cacao. Each of the four types of cacao were fermented in the same manner at the same location, and replicated 3 times each. The data above reveals that the species of yeasts and bacteria involved differed according to each of four types of cacao. Why each variety had its own unique population of microorganisms is not known here, and wasn’t the aim of this research. Following the fermentation, the cacao beans were dried and processed into chocolate according to the type of cacao. Each of the 4 chocolates were analyzed for volatile compounds (aroma molecules) and other sensory attributes (taste, smell, texture, etc.). Just as in the fermentation masses, the chocolates also differed according to type of cacao. The quantities and types of aroma molecules involved were different for each type of chocolate. This suggests that the varieties of cacao does impact the attributes of the chocolate made from the same cacao. The researchers here also suggest the difference in aromas, to a degree, are due to the different microbial metabolisms between the different cacao masses. Since fermentation helps prepare the state for aroma formation, it makes sense to suggest that the different populations of microorganisms may have lead to the differences in the aroma profile of the chocolate. However, I would like to add that although these microorganisms do impact the aroma formation within the cacao, each type of cacao also has its own “building blocks” of molecules dictated by its genetics. Overall, it appears that the variety of cacao impacted the populations of microorganisms, which impacted the quality of the final chocolate. The researchers conclude with a suggestion to ferment cacao with their own variety and use yeast as a starter culture to get it going in order to better standardize the fermentation process. Newer PostIs it worth it for farmers to grow fine cacao?